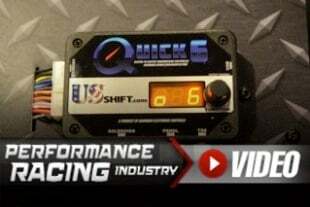 In the most recent episode of the $10K Drag Shootout show, all four teams were busily making their final push to get their cars finished before the bell and ready for the big showdown in Ohio. With time running out, The Dream Team, Team Boddie, Team Stinky Pinky and Team Bigun were all able to wrap up their builds to do battle at the Shakedown At The Summit to determine the champion of the Horsepower Wars $10K Drag Shootout. It was a brutal 10 days for all of the builders that encompassed a roller coaster of emotions, but in the end, each team had a car that was ready to be loaded up and sent to Summit Motorsports Park. After the teams were done with their builds, the cars made the long journey from Horsepower Wars HQ in California to Big 3 Racing in Hinckley, Ohio where they would be picked up. Upon the arrival of each team, they were greeted with the surprise of some rust on their rides from the trip and sitting in storage. This wasn’t a huge issue and even gave each car just a little more character. A surprise that wasn’t exactly welcome for the Dream Team was their Mustang not wanting to start when they were ready to load it into driver Dwayne Gutridge’s trailer. After a quick diagnosis, the team figured out that the rust had gotten to the starter on the Dream Machine causing it to not function. Luckily, the guys at Big 3 Racing had a used starter that fit after some modification and the boosted LS engine fired right up. Team Boddie was the second to arrive after their flight from the west coast; they gave the G-Boddie a quick inspection to see how it fared during the trip. The car did have a few extra dings, but appeared to be in functioning order. Since the team didn’t have a way to transport the car to the track, they called on AAA to haul the Regal. A big test for the G-Boddie was if it would actually move forward under its own power after it wouldn’t on the last day of the build. When the big Chevy engine was fired up, the team was able to drive it onto the rollback without any issues. The final two teams to arrive at Big 3 Racing to retrieve their cars were Team Bigun and Team Stinky Pinky. With no real issues getting Beer Money loaded up, Lyle Barnett and Team Bigun decided to have some fun around the Big 3 Racing shop with the crew from Team Stinky Pinky as they picked up Dr. Rod Knocker. When Dean and his crew saw the rust on the good doctor’s zoomies, they decided it had to stay since it matched the car’s personality so well. 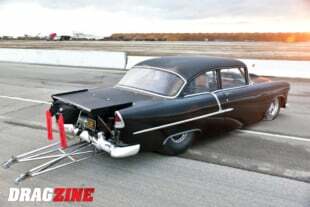 After the teams got their cars to Summit Motorsports Park, they had to get their pit spaces set up and prepared for the racing portion of the $10K Drag Shootout. Since each of these cars hadn’t been on a track and only seen limited run time, there was the possibility for problems to arise when the teams started to push their cars in race mode. Each team received an extra $500 for any repairs that might be needed when they started running their cars down the track when they arrived at Summit Motorsports Park. Besides the $500 given to them at the track, each team had the option to take advantage of the “Fresh Prince of Bel Air Rule” that was laid out within the Horsepower Wars $10K Drag Shootout rules. This was built in to give each team some extra money if they ran out of budget due to a miscalculation or serious breakage at the track. The teams could use their own money up to $1,000 as part of this budget … but there’s a catch. For the first $500 the team uses, they must add 100 pounds to their car. If they use the full $1,000, they have to add another 100 pounds to their final base weight. This would become a major factor later. Team Stinky Pinky took advantage of this option while they were completing their build at HQ, leaving them without the option once they arrived at the race, and not very much money left over. After every pass, each team would have to report to the scales to make sure they were at their designated minimum weight as set by the rules of 3,200 pounds. Since Team Stinky Pinky took advantage of their Fresh Prince budget, they had to tip the scales at 3,400 pounds. Team Bigun got to weigh 3,175 pounds as they earned a lower weight by winning a contest. To make sure everything was kept fair for all the teams they were all issued VP Racing Fuels C16 race gas by the Horsepower Wars staff. Going with a spec fuel allowed for more control over what each team had access to during the competition. The C16 fuel was the best choice due to its properties to work with different combinations to make power. Throwing all of these unproven cars directly into a winner-take-all scenario wouldn’t be the best way to see what each car was capable of, and that also might lead to some significant carnage. To have the best racing possible, each team was given a total of five qualifying shots at the track, so they could dial-in their car before eliminations began. After the five rounds of qualifying was done, the teams were set on a pro-style ladder where the number one qualifier would face number four, while the number two and three qualifiers would face off in round one. With all the hard work of 10 intense days of building complete, it was time to see if each team’s car would perform on the track. Before the first round of qualifying, the level of tension in the pits was at an all-time high as everyone prepared their cars and waited for the call to the lanes to begin their march towards the $10K Drag Shootout title. The first qualifying session for Team Stinky Pinky and Dr. Rod Knocker raised more questions than the team was ready for. As the car rocketed down the track, there was an obvious issue with the front suspension as the wheels chattered back and forth. It was later discovered that the root cause of this was a set of bad ball joints. The pass was ultimately cut short when the burst panel on the intake manifold blew out when the car hit the rev limiter that was set too low. 12.29 at 74.1 mph was the first hit. For the Dream Team, the first pass was uneventful in a bad way as their Mustang seemed to be extremely sluggish the entire length of the track. The car was also struggling to stay running after the burnout, and that caused some tense moments on the starting line. A tuning issue was at fault for the problems during the first qualifier, and the experience of the Dream Team was prepared to address this between rounds. Big Daddy lifted to a 11.52. Team Boddie had the most uncertainty surrounding their car since it never made it to the dyno to be tested properly. The Regal’s suspension geometry was a big issue as the car spun hard right at the hit, the shocks bottomed out, and the driveshaft impacted the chassis. They limped to a 14.12 at 62.8 mph. Lyle laid down a big number on the first run, lifting at half track and ripping a 9.23 at 130+ mph. Howeever, Team Bigun’s first qualifying pass showed them a few things that needed to be changed and revealed the weak point for some parts, as well. At the top end of the track, the wastegate failed on Beer Money, leading to a spike in boost that reached 30 pounds. 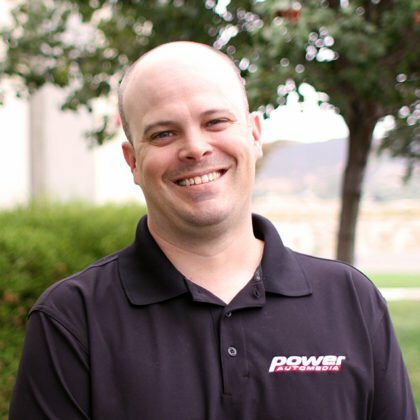 To address this issue, the team made the swap to a 66mm wastegate that they knew worked to avoid any issues in the future. The fuel cell on the Mustang also developed a hairline crack and needed to be repaired before the second round of qualifying. After trying to solve the issues from the first qualifier Team Boddie hit the track first during the second session. Unfortunately, the results were about the same as the team spun hard again; this time it was due to the Regal’s big-block Chevy engine smashing into the rev limiter after the shift light wasn’t set correctly. However, they did step up a little to go 11.42 for the #4 position. Taking what they had learned from the first session, Team Bigun decided they wanted to pour some power into their boosted Mustang for round two of qualifying. The car spun and the team wasn’t able to get any data from the pass because their data recorder didn’t activate as expected. Team Stinky Pinky worked late into the night and early into the morning, trying to get their Camaro ready to go after discovering all of the front suspension issues they had. They stepped things up big time with a 9.58 at an impressive 152.97 mph. They still had a lot of work to do, but were #2 qualifier. Trying to be innovative, the Dream Team created their own boost controller out of some old electronics to work with the stock computer in their Mustang. The problem was that their use of antique technology was fighting them every step of the way and provided them with more issues during the second qualifier, and that led to a less than stellar run, but a major improvement at 9.53 to go #2. The third round of qualifying was still a challenge for the Dream Team as their problems seemed to continue. After working with the tune and the electronics in the car, everything seemed to be in place for a breakout run until Dwayne left the car in high gear at the beginning of the run, leading to a slow pass. Team Boddie’s third qualifying pass was wrought with problems that led to a serious overnight thrash. The Regal’s rear suspension tried to remove itself from the car, leading to the tires being destroyed. After further inspection, the team discovered they would need to completely redo everything in the back of the car before it could race again safely – new 4 link brackets, repaired shocks, etc. It would be a long, long night. Everything finally came together for Team Stinky Pinky during the third qualifying session as they were able to get the Camaro to put an entire pass together. Dr. Rod Knocker left the line hard and rocketed down the track to a 9.12-second elapsed time at 149.9 mph to go #1. This was the quickest pass thus far in qualifying and put Team Stinky Pinky on the pole. Team Bigun was still wrestling with issues trying to get their Mustang down the track on a full, clean pass. As Lyle tried to launch the car, it spun the tires again, leading to a slow pass that the team didn’t need. The main focus for Team Bigun at this point was to just make it down the track without blowing the tires off or having a mechanical failure. With the third qualifying session leaving their Regal in a state of ruin, Team Boddie thrashed all night to try and get the car ready for the fourth qualifying session. While the thrash was ongoing, team leader Russ Wullenwaber was knocked out when the car slipped off the jack. All of that hard work paid off as Boddie wheeled the car on a wild pass that led to a 9.27-second time on the boards. The Dream Team’s fourth qualifier was filled with drama that was both good and bad. As Dwayne tried to stage the Mustang, the car rolled the beams and jumped the tree. They backed and did launch, the car pulled a massive wheel stand with full boost, and they ran an 8.56 which was a huge statement for the team. However, the starter and Norwalk/Shakedown track crew, following NHRA rules, D.Q.’d the run because of leaving before the tree activated. All of the efforts from Team Bigun finally started to pay off as they made a healthier 9.19-second pass, even though it spun a little bit early. Even with their best effort yet, the team wasn’t satisfied with the outcome and was ready to find a way to gain more for the final session of qualifying. Team Stinky Pinky was able to hold onto their top qualifying spot and become the first official team to run in the eight-second zone in the $10K Drag Shootout. With a stellar 1.28-second 60-foot time, Dr. Rod Knocker laid down an 8.98 pass and showed that it was a player in the competition. For the final round of qualifying, Team Stinky Pinky decided to play a game of strategy and sit out. With a high qualifying spot seeming to be a guarantee, the team wanted to save parts on their Camaro and be sure it was in the best shape possible for eliminations. With the confidence from a successful run in the fourth qualifier, Team Boddie decided to dial up the nitrous tune a bit on their Regal. This turned out to be a poor choice as the car suffered a massive nitrous backfire that shredded their hood scoop. Team Bigun wasn’t able to improve their qualifying position as the Beer Money Mustang spun the tires yet again at the starting line. Going into eliminations, this left the team with little data to create a race-winning tune-up in these difficult conditions. The Dream Team finally put everything together and lit the boards with a legit eight-second pass that would put them in the top spot over Team Stinky Pinky. With so much on the line, the Dream Team didn’t plan on making any huge changes before eliminations began on Sunday, with an 8.66 at 158 mph run. A run they thought put them in the #1 position. 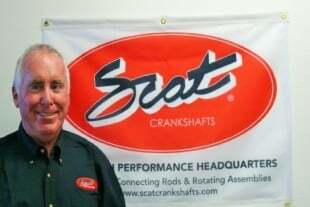 Billet Turbos, Controversy, and a Boycott? After qualifying was complete, controversy broke out in the Horsepower Wars pits over the Dream Team’s turbocharger. The other teams discovered the Dream Team had changed their turbo on the Mustang from a 75mm cast wheel turbo purchased as part of their $7000 Summit Racing Gift Card budget, to a billet 80mm turbo. The team had requested to sell the 75mm turbo they had bought, and used the money toward a used, billet 80mm. A review of the rulebook clearly lists this as not legal, as you could not sell parts, or trade parts, to 3rd parties. However, a Horsepower Wars tech official had known about the sale and upgrade to the larger turbo in August, and made a clear error by NOT flagging it as illegal. The other $10K Drag Shootout teams became upset with how the situation unfolded. Show creator James Lawrence (and former NMCA/NMRA Tech Committee Director) had to get involved to discuss the situation. The rulebook was clear – the turbo sale from Summit to a third party was not legal based on the rulebook every Horsepower Wars competitor had received. However, the Horsepower Wars tech official also had not caught the infraction, and had approved the purchase, in error. It was a difficult situation, but ultimately, it is the racer’s responsibility to know the rulebook and to follow the rules 100% of the time. YES – a Horsepower Wars official made a mistake, without a doubt, in not catching this when it was submitted for approval. But the turbo that was on the Dream Team’s car was not obtained in a method that was legal. As such, the only available options for the Dream Team were to return to the cast 75mm turbo wheel, or to use their “Fresh Prince” budget to purchase the larger turbo, but would take a weight hit. To keep the race going, all of the teams discussed a compromise that would be fair for all involved. The Dream Team discussed, and all 100% accepted adding 100 lb. to their car as per the rulebook, and they would be placed in the #4 qualifying positions. The other teams accepted that the Dream Team could retain the larger turbo. 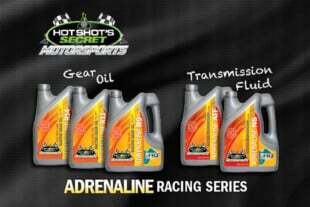 These conditions allowed them to keep their new turbo and kept things on track for all the teams to face off on Sunday. The drama from the questionable turbo over with, they were all still amped to race for the chance to win the prize money and their car. The first pair down the track during eliminations was Team Stinky Pinky versus The Dream Team. Stinky Pinky driver Dean Karns’ wealth of bracket racing experience made him lumberjack on the starting line, while in qualifying Dwayne was showing a bit of rust on the line for the Dream Team. This was quite a race, as Dean had been very consistent in the high 8 second zone, and Big Daddy had run 8.50s and 8.60s at a lower weight, but not in a ‘race’ situation. With the turbo and staging challenges, would the extra power be enough to chase down the very consistent Pinky? On the starting line, Dean left with a .112 to Dwayne’s .168, and outran him to 60-feet and 330′. 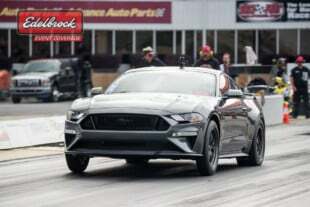 However, by the 1/8 mile, Big Daddy was chipping away, with a 5.712 to 5.733 advantage, which he stretched out to a 8.82 to 8.95 win, a narrow .0751 at the stripe. It was a big win for the Dream Team, and showed that the extra weight and soft tune up would be a reliable 8-second player. The other first round pairing featured the two teams who struggled to make clean passes: Team Boddie and Team Bigun. Neither team had the best of luck in qualifying, with Team Boddie’s suspension issues and their huge nitrous backfire, and Team Bigun hadn’t been able to get any traction on the starting line. Neither of those issues came into play as Boddie rolled through the beams, handing the win to Team Bigun. Jay Boddie was devastated. But his car hadn’t raced clean all weekend, and the trans brake gremlins were to sure to blame. Even though Team Bigun made their quickest run yet with a 9.0, they still struggled with spinning off the line going into the finals. The stage was set. Bigun vs. Dream Team. Maybe the race that all along we thought might have been. Bigun had nothing but problems with wheel spin, while the Dream Team had 3 licks in the 8 second zone. Suddenly, Bigun had a major issue with their front brakes and caliper alignment. The wheels were sticky and frozen, due to an issue with properly adjusting the caliper spacing. The team wasn’t sure if they were going to make it, using up every minute and every second before making it to the staging lanes with less than 1 minute to spare. After an exciting first round of racing, the stage was set for an epic showdown in the final between the Dream Team and Team Bigun. Both of these squads had the combinations that made the most power on the dyno, and they also had talked the most trash during the build phase. Talking to both teams, there was a major philosophy difference. Dream Team was going to play it safe, stepping it up a little bit, but realizing they had run 3 times in the 8s in a row, and Bigun hadn’t been able to yet run an 8. On the other side, Bigun decided to be very aggressive, and try to outrun the Dream Team with a moon shot. With anticipation running high on the starting line, everything as on the line. $10,000, the glory, and the car. Lyle left first, with a killer .047 light, and streaked to a stunning 8.51 at 164.31 mph.. on the other side of the ladder, Big Daddy went deep, and probably to avoid red lighting, was cautious on the tree, which resulted in a slow .274 light. Giving up almost .250 to Beer Money was too much, and they also got outrun, going a conservative 8.68 at 158.35 mph. Team Bigun found the perfect time to extract the most out of their Mustang when everything was on the line. The team’s victory put them in the history books as the first ever $10K Drag Shootout champions and showed what you can do with a small budget, a junkyard car, and a lot of determination. The $10K Drag Shootout has been made possible by some of the leading companies in our industry including Royal Purple, Comp Cams, TCI Transmissions, Mickey Thompson Performance Tires & Wheels, E3 Spark Plugs, Fragola, Holley, Diablosport, MAHLE Motorsports, Dyna-Batt, ProCharger, Weld Racing, ARP, BMR Suspension, QA1, PRW, Covercraft, and of course, Summit Racing.